The Soi Dog Foundation, an organization dedicated to fighting animal cruelty and homelessness through improving the lives of dogs and cats in Thailand, has a naturally compelling mission. For many of us, interaction with animals is part of our human experience. Still, sincere effort is invested in ramping up their compelling factor, and they’ve achieved this through their website, videos, and other communications materials. For these reasons (and probably more), SDF stands out from the herds of animal welfare-related organizations out in the world. An email from SDF’s cofounder, John Dalley, recently landed in my inbox, and what an email it is. The subject header instantly captured my attention, motivating me to immediately stop what I was doing and read on. I was introduced to Scooter and her heartbreaking ordeal. This horrifically mangled, injured pup was battling an infection, broken spine, and the loss of her back legs. I couldn’t imagine the insufferable pain and the evil that had befallen such an innocent creature. Now it’s your turn to read, because with this harrowing tale comes hope. Hope for sweet Scooter and other animals like her, and that hope was made possible by SDF’s amazing donors — donors like me. I ask you, who doesn’t enjoy a story, especially when it involves both a cute and cuddly creature and a happy ending? Look at how happy she is after being given the chance to heal — a chance at life. And who doesn’t like feeling like a hero? 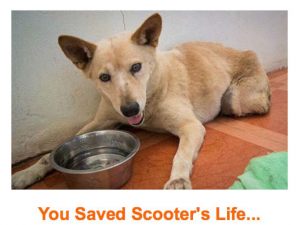 Thank you for your kind words and more importantly thank you for helping the animals in Soi Dog’s care! Thank you for providing such amazing examples of Soi Dog’s work, Leonard. Would love to catch up sometime.